A family camping in the Brown Mountains of North Carolina has a deadly encounter with extraterrestrial life forms. 11-year-old autistic boy Riley Morris records a family camping trip with his father Peter, mother Katie, brother Corey, and sister Jillian. On the first night at the campsite, the three children see a trio of strange lights in the sky. In the morning, a dead animal is found on the ground. After becoming lost on their way to a second campsite, a crow flies into their vehicle before the family encounters a series of abandoned cars along a deserted country road. While Peter and his sons investigate the vehicles, aliens attack and take Peter. Corey and Riley escape with Katie and Jillian as dead crows begin falling all around their car. On foot, the Morris family makes it to the woodland cabin of an outdoorsman named Sean. While waiting for Sean’s brother Scott to return, Sean tells them rumors involving the Brown Mountain lights and alien encounters. Sean arms himself and leaves when his brother radios for help. Left alone in Sean’s cabin, the Morris’ are helpless when the aliens arrive and abduct Corey. After being unable to rescue his brother, Sean returns to collect Katie, Jillian, and Riley. When bright lights stop his truck on the road, Sean tells the remaining family members to flee on foot. Katie, Jillian, and Riley make it to a barn where they hide from the lights. Sean later reunites with them, but a beam from the sky then abducts Katie and Sean. Riley and Jillian become separated in the forest after fleeing the cabin. Eventually, brother and sister reunite and make it back to the road in daylight. A sheriff’s car finds Riley and Jillian, but the aliens return once again and forcibly take the remaining humans aboard their spacecraft. One Year Later – North Carolina police discover Peter Holden naked and disheveled on a rainy road in the night. The good news is that the U.F.O. encounter aspect of “Alien Abduction” sets it apart from the glut of “found footage” films focused on paranormal activity and haunted asylum investigations. 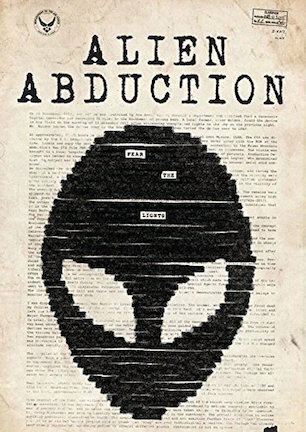 The not-so-good news is that “Alien Abduction” still borrows too heavily from a familiar formula for a story that never fully capitalizes on the uniqueness of its premise. There is a bit of a “based on true events” element to “Alien Abduction” coming from urban legends about unexplained ghost light sightings in the Brown Mountain region of North Carolina. Bookending the film are a collection of interview clips with paranormal researchers and supposed eyewitnesses describing the phenomenon with all of the earnest conviction one would expect of possibly crackpot UFO enthusiasts. Presumably to offset them from the main movie, these scenes are also needlessly in black and white, and so the folksy local prelude becomes the first step into “Blair Witch Project” territory with a setup seen before in this style of film. The fictional Morris family is on a camping holiday in the same real-life area where these lights in the night sky are known to appear. Their s’more-roasting vacation soon becomes a forest-fleeing nightmare when a wrong turn results in an extraterrestrial encounter and people start forcibly disappearing in bright beams of light. In one of the oddest creative conceits ever employed to explain why the camera is always recording even when putting it down and beating feet would be a more sensible action, the camcorder in question is in the hands of an 11-year-old boy whose autism requires regular camera usage as his main means of interacting comfortably with the world. Even though a backwoods redneck appearing later on describes young Riley Morris as “slow,” his behavior is actually quite normal, suggesting that the only questionable reason he has autism in the first place is to motivate the framing device. Character introductions come by way of campfire bonding and a prank pulled on mom regarding some racy song lyrics to generate an “aren’t they cute” likability to the Morris clan. For the most part, it works. There is nothing particularly noteworthy about their personalities, but by the time dad flips his lid after getting lost and running low on gas, there is something funny about the notion that an impending alien probing will be his comeuppance for an “I’m turning this car around” tantrum. Although act one snakes slowly along that well-trod path of traditionally slow “found footage” lead-in, “Alien Abduction” lives up to its title by the 25 minute mark, and keeps the Morris family in danger from there on out. The trouble with the movie’s approach to generating frights is that it basically has only two tricks up its sleeve. When a scene calls for tension, bright light shafts burn through cracks in the cabin as family members hold their collective breath and wait out the aliens’ sweeping search. When it comes time for a payoff jolt, the camera cops out with convenient electromagnetic interference resulting in wonky footage and abrupt cuts to black instead of a solid peek at the goods. It is an alternating routine of restraint that wears out its welcome faster than forced scenes of emotion when the kids cry over the surrounding danger. The unavoidable criticism bogging down the film is that the alien abduction angle becomes a throwaway setup for what ends up being a cabin in the woods rehash. The Morris family is terrorized, chased, forced to hide in a cabin and in a barn, and at no point does it make a difference that unseen aliens are the threat causing so much panic. It could just as easily be a pack of wolves, Bigfoot, or the inbred hillbillies of “Wrong Turn” outside the door and almost nothing about the plot would change. Clocking in at only 70-ish minutes before the end credits sequence, “Alien Abduction” is a relatively inoffensive way to burn a night of horror movie viewing. But the novel alien abduction aspect, which should be the key advantage in breaking apart from the competition, is squandered by following a “been there, done that” recipe for “found footage” horror. “Alien Abduction” delivers a technically polished finished product. But with so little of the aliens actually glimpsed, and with so much of what takes place being no different than any other “bump in the night” woodland thriller, it is a missed opportunity to create distinct scares that would really affect those prone to E.T.-related nightmares. NOTE: Additional scenes play during the credits. March 28, 2014 by Ian Sedensky.